So after a long hiatus from this little space of the internet I call my own, it feels so good to be back and writing again. If this is your first time visiting, hi and welcome and for those of you who are old friends, thanks for coming back and sorry its been so long. Lucas is now 6 and Charlotte is 2 and boy have they changed since the last time we spoke. Lucas started school and has just finished his first year and what a proud mamma I am. 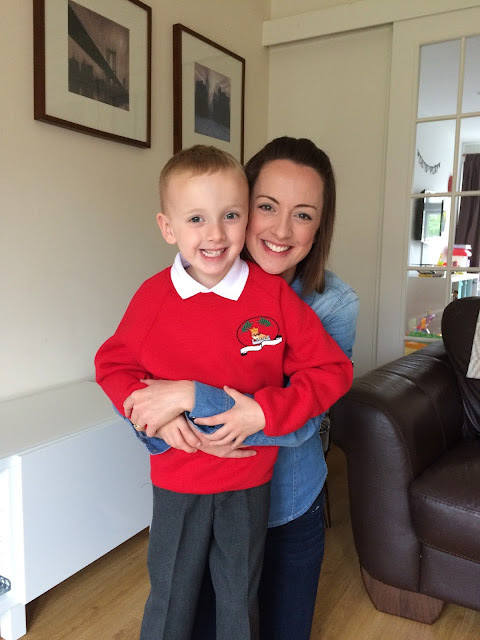 For the most part he took it in his stride, as I knew he would (even though on that first morning when I waved him off from the playground my heart was in my throat as he took his first real step of independence in the world). And Charlotte, well where do I start. As she has become a little girl rather than a baby she is definitely no shrinking violet and gives us all a run for our money on pretty much a daily basis. She is fiercely independent which I kind of love and is fearless, with a cheeky sense of humour. This fearless nature of hers is quite a challenge for me as its unchartered territory. Lucas has always been quite a timid little boy and always airs on the side of caution, sometimes to his detriment. But with Charlotte she goes at life full force and I just try and keep up and catch the falls. Anyway, there's plenty time for us to catch up properly, but for now I just wanted to say hi and that 'A Cosy Cup of Life' is back - I hope you'll join us for the ride. In the meantime here's a few more of my favourite pics from over the last year or so. Since I've started blogging I've come across so many amazing women who are running their own businesses, as well as raising a family. It seems that more and more mums are becoming their own boss. Whether that's running a shop, an online store or offering a service like writing or photography. I love finding out what made them choose this path, what spurs them on during the more challenging days and weeks and how they juggle motherhood and the business world. A little over a year ago I met Nina who is a working mum and her own boss. She runs a local vintage furniture and interior design business which I stumbled across on Facebook. 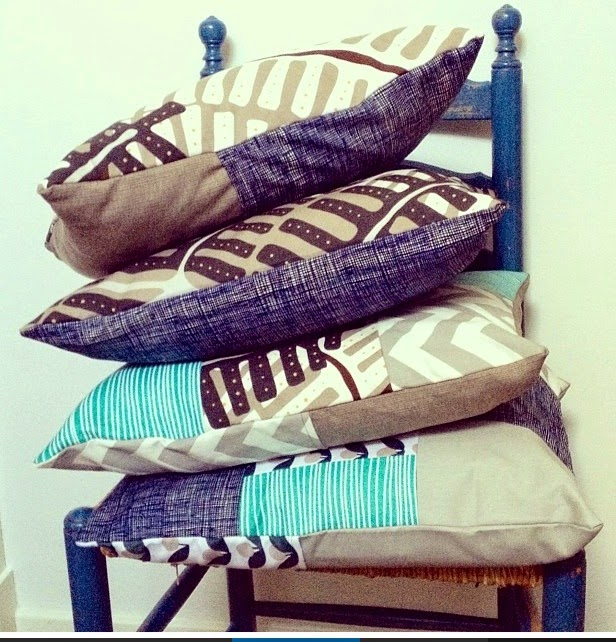 Her style is amazing and I pretty much got in touch with her straight away to ask her to create some cushions for our living room. I love Scandinavian style, which is very much her influence, so I knew I would love what she came up with. We'd just moved into our new house and didn't have the budget to completely decorate, so instead decided on little touches like these cushions as a way of injecting our own style into our blank canvas home without breaking the bank. 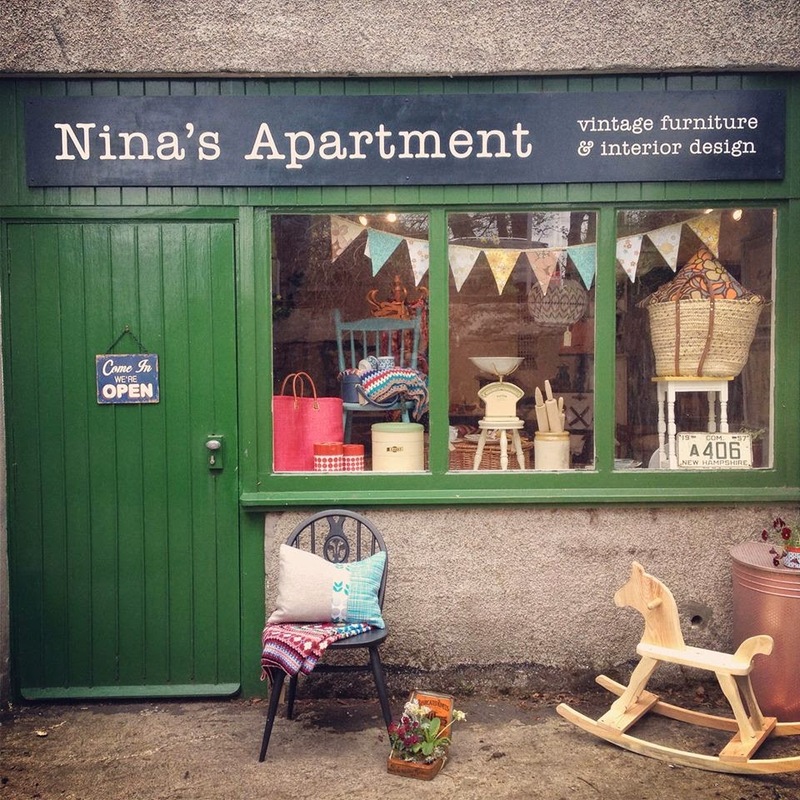 Nina was heavily pregnant with her second child at this point, but now a year or so on, she's back at work and our paths crossed again, so I decided to find out a bit more about her, her family and her business and how it all works together. Hi Nina, so tell me a bit about yourself? I'm a 36 year old, Dutch, married to Glenn and mum of two little boys (3 and 1). It’ll be 10 years this June since I moved from The Netherlands to the North East of Scotland. I had never heard of Aberdeen before I met my now husband, in a pub in The Hague on that random Friday night and I certainly never anticipated still being here, now with two kids, two cats and my own business! I now love it here, especially living in Aberdeenshire, with the hills in my backyard, but the first six months were agony, having come from a country with a bit more colour, café culture, generally better Summers and well yes, better home interior shops! And tell me about your business, Nina's Apartment? I have been in business since 2011, first as an online shop selling smaller vintage and handmade items via Etsy and since August 2012 I have had my own ‘real’ shop in the old mill at Lethenty Mill, just outside Inverurie, Aberdeenshire. I specialise in original mid 20th century furniture and homeware, Scandinavian and British made, and I also ‘upcycle’ the odd vintage piece. A few months ago I branched out into teaching upcycling classes, giving unloved furniture a new look with chalk paint or some new upholstery. It’s great fun and very satisfying to inspire people to mix and match the old and new and add some personality to their homes. I have always been interested in art, architecture and design and have done a number of arts jobs in both The Netherlands and Scotland. Despite my love for interior design and vintage finds, I only seriously started thinking about turning this passion into work about five years ago. 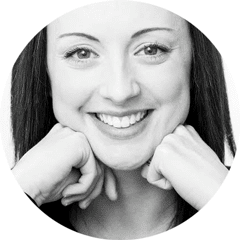 It took me some time to take the plunge, because running your own business means a lot of hard work – mostly on your own, financial risks, no holiday pay and no salary paid into your account at the end of the month. Still, that fire inside me kept burning and things came together when I was expecting my first child and my then employer told me that my job was going to be uncertain with all the budget cuts in the arts. It was a now or never kind of feeling. 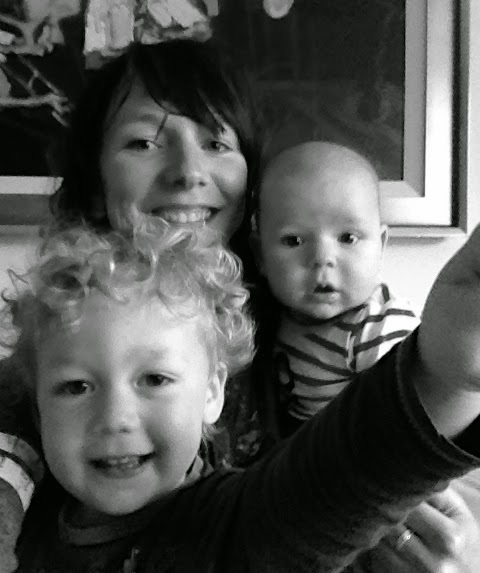 How do you manage to juggle running a business and being a mum to two small children? Going to bed early, haha! It is hard work, but I love it. 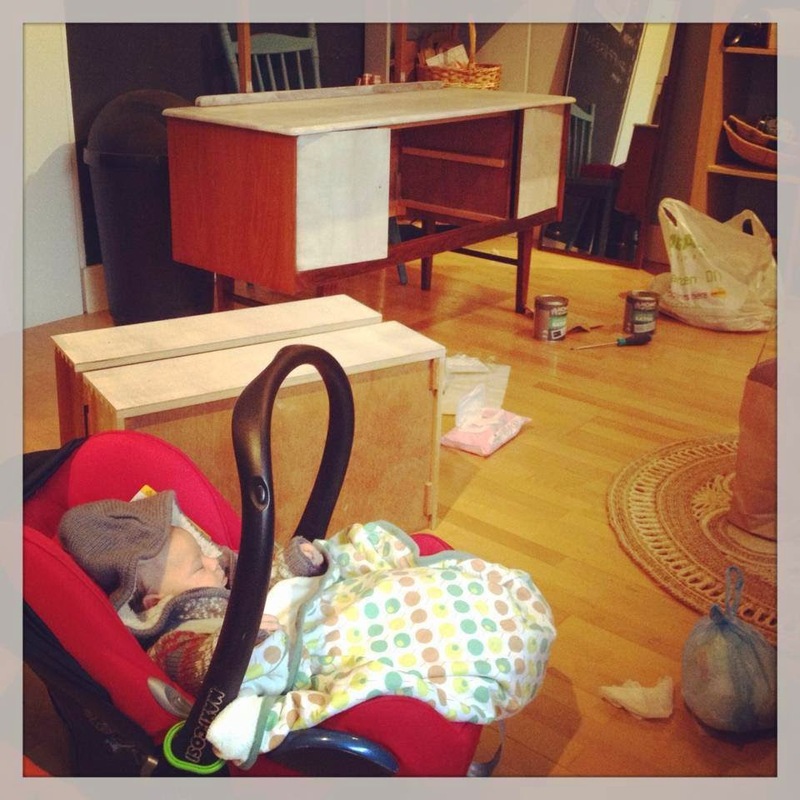 A fond memory is when I just had the keys to my shop and I invited a group of friends who were all on maternity leave to come and help out redecorating the place. It was hilarious, having one mum entertaining a frenzy of crawling babies in the corner while the others were painting the walls in between feeding and changing nappies. Now I have two kids, it’s even harder, but I luckily have a few days to myself when they are with a childminder. On the days when my boys are with the childminder I drop them off at 8.30am, then I might go back home and enjoy a quiet cup of coffee at my computer doing admin, responding to emails or doing marketing. Later that morning I often go out to buy furniture. I get a lot of people contacting me now who are clearing their house or selling the odd piece – this can be all over the North East of Scotland, so I do a lot of driving. I might also deliver furniture that day or spend some time in my shop rearranging and styling things, and taking good photos for the website and social media. I am mainly open by appointment just now, but I often get a customer in for a look around too when I'm at the shop. You see, I didn’t say anything about having lunch, and I have to admit that’s the one thing I often forget! I work every minute on those days without the kids. At 4.30pm I pick them up again and we go home. Then it’s the usual routine of dinner, playtime, a DVD or books and off to bed. Oh yes, and of course a few fights, time-outs and meltdowns too! After they've gone to bed I check my email and the Facebook page for messages and respond to any enquiries. On days that the boys are with me I obviously work a lot less, but they do come with me sometimes to collect or deliver furniture or meet a customer in the shop. I always make sure that on those days we do something fun for them too, like going to the park or a playdate. 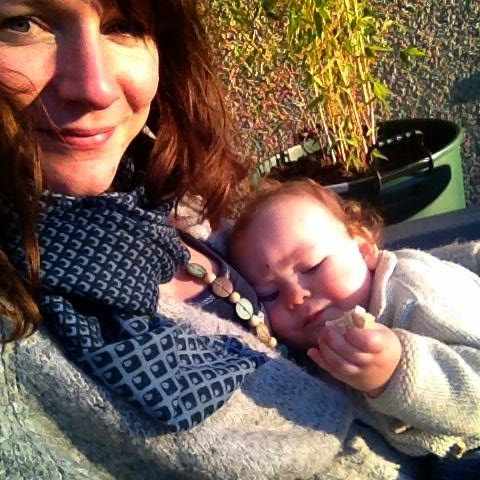 What's the hardest thing about being a working mum/ having your own business? I guess it’s the eternal struggle between wanting to do both really well and not having enough time and energy. I would love to double the hours I put into my business to start making a proper living out of it, but at the same time I enjoy spending time with my children, especially when they are still so young. It can also be quite tiring not knowing what next week is going to look like and how to make it all work. My husband works full time and we have no relatives living nearby to help look after the kids, which makes things tricky sometimes. And what's the best thing about being a mum with your own business? Apart from the fact that I am my own boss, which is a great feeling, it’s that despite being so busy I have the flexibility to organise my working life around my family. I often have my 1-year old with me on buying trips, the same as I did with my eldest when he was a baby. People generally love little children and it breaks the ice when they see I'm a mum as well as a business owner. I see a lot of different places and homes and it is fascinating. I have met so many nice people in the past few years and it is great to here the stories behind the furniture they are selling. It makes me happy being able to tell a customer the history of something because I know where it came from. Have your children inherited your creativity? My boys are still very young so it’s hard to tell, but my 3-year old definitely shows some artistic tendencies with his love for drawing and music. Also, with the amount of houses and old stuff we've come across the past few years, one of my sons is bound to become an antiques dealer! After having been so busy with a new baby last year and not having worked as much as I would have done otherwise, I am upping my game a bit this year. I am planning to increase my hours, my profile and wish to generally becoming better known up here. I’d like to become more selective in the stock I buy, offering really stunning pieces. I also would like to increase the programme of classes at my studio, involving other local creatives too. I just love my job so much that I want to make it work no matter what. No way do I want to go back to an office job. I get so much energy from doing this. 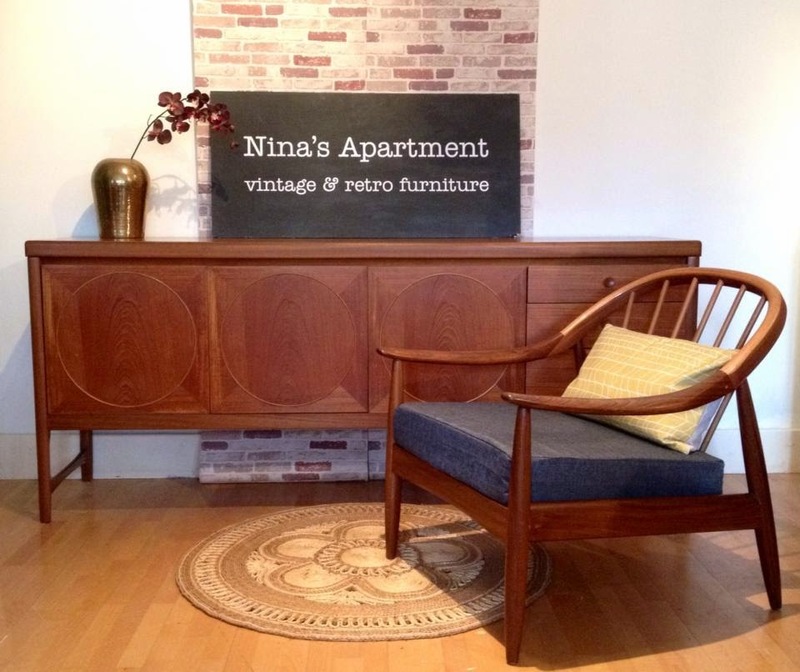 To find out more about Nina'a apartment and to take a peek at her latest stock and classes click here. Its been a couple of weeks since I last did my #littleloves and I've really missed it. The last few weeks have been a bit chaotic and I've felt like I've just chased my tail and not been very productive But this week has been better and I'm so happy to be back joining in with Morgana from But Why Mummy Why for my #littleloves. It finally feels like Spring has sprung don't you think? Its almost light when I'm getting up in the morning, there are Easter goodies everywhere which is so exciting and its be warm enough to even abandon the winter coat on a couple of days. It felt even more like Spring on Tuesday when my #Springtime Surprise parcel arrived. A gorgeously decorated box full of treasures. I can't stop looking at all the pretty things and finding new homes for everything. If you haven't heard of the Springtime Surprise Project go and check it out here where you can sign up for the next one. I've already registered and can't wait - its so much fun! I've been reading lots of information on making the transition from breastfeeding to bottle feeding. I've really enjoyed breastfeeding Charlotte, especially has I didn't manage with Lucas, but it has also been hardwork. Now that Charlotte's 9 months old, my back to work date is looming and I have a few nights away planned I felt the time was right to make the switch. Charlotte however had other ideas and has so far literally been pushing the bottle away and spitting out any milk I have managed to get into her. We've only been trying for a few days but boy is she digging her heels in and its left me feeling a bit stumped as to what to try next. So I've been Googling away, messaging friends and posting on breastfeeding advice sites for suggestions on how to crack this. Any advice/ tips are gratefully received. The new series of One Born Every Minute. I tortured myself watching this programme throughout both my pregnancies - intrigue got the better of me and I couldn't resist watching it each week (sometimes through my fingers). I've been glued to it again now that its back on Channel 4, because this series is set in the Liverpool Women's Hospital. We lived down in Merseyside when we had Lucas and although it wasn't this hospital I had him in, I did have a few antenatal appointments and some pre-natal yoga at the hospital, so watching this makes me feel all nostalgic. The lady from the Nike Running App in my ear. I have now done my first couple of runs in preparation for my 5K in June and love this app. Its great at tracking your progress which keeps me motivated. I really need this! I have also been loving The Paper Kites and especially the track 'Bloom'. We dug out some of Lucas' old baby toys for Charlotte this week, including a box of wooden building blocks. I remember how much Lucas loved these when he was Charlotte's age, and it seems he still loves them. Charlotte hardly gets a look in because Lucas has been busy building all kinds of creations, including this one which he was especially proud of - a Zoo. This week it has been something Charlotte wore that I loved. These super cute tights from Marks and Spencers. I absolutely love their kids Spring Summer range, especially the girls section which has a lot of bold primary colours. A nice change from the usual pinks and pastels. There is so much to choose from but I have definitely spotted a few favourites that I need to go and pick up for our Summer holiday. I was sent the most gorgeous bouquet of flowers last week from the lovely people at Bloom & Wild. You can check out my review here and there's also a 15% off discount code. I love having flowers in the house and these were especially perfect as the name of the bouquet is the same as my little girl, 'The Charlotte'. I love having flowers around the house. Whether I wake up to a sunny spring morning or a gloomy grey sky, seeing a bright bunch of flowers instantly lifts my mood and makes me smile. The flowers came in a very striking, slim brown box which is designed to fit through a standard letterbox. What a clever idea, when we all lead such busy lives these days and are rarely at home to accept a delivery. The box just added to the excitement for me too. The bouquet I'd been sent was especially exciting because it was called 'The Charlotte' which is my baby girl's name. A note was tucked inside, which read "I hope that you and your Charlotte enjoy our Charlotte!" - so lovely. On opening the box I have to admit I squealed with delight a little! They looked so pretty and as I started to take the flowers out of the box I realised just how much care had gone into packaging them up. The most delicate flowers, the Lisianthus, came wrapped in netting to make sure they were all in perfect condition. These flowers were actually the star of my wedding bouquet, which was a complete coincidence, but made them even more perfect for me and brought back lots of happy memories. The box was full to the brim of these purple beauties, as well as some crisp white flowers and spring fresh greenery. Bloom & Wild also give your inner florist a helping hand by including in the box, a little card which gives you the name and a description of each of the flowers and a step by step guide on how they suggest you arrange them. I have to confess that normally I make a bit of a pigs ear of arranging flowers in a vase and end up just dumping them in and hoping for the best. So this little guide was perfect for someone like me and made it so much fun. When I'd finished I stood back and admired my arrangement feeling quite proud of myself. It certainly wasn't my usual effort. I have also be really pleasantly surprised at how well they have lasted. I've had them for a week now and they are still sitting pride of place in my living room and the smell when I walk into the room is amazing. Bloom & Wild wasn't a name I was familiar with until a week ago but I've been really impressed. They'll be the first people I think of the next time I want to send someone flowers for a special occasion or even just as a little surprise or thank you. Its just so different which makes it feel that bit more special and the quality of the flowers is amazing. They also do a monthly subscription service which is something I might treat myself to. How exciting to get a different bouquet through your door each month. NB: Thank you to Bloom & Wild for sending me this gorgeous bouquet. All words and opinions are completely my own. I'm amazed that my little Charlotte has now spent the same amount of time on the outside world as she did inside me. How did she get to be 9 months old so quickly?! Its at this stage that I think they very quickly lose their real baby-ness and start becoming a little person. I mentioned in previous posts that second time round I'm really in no hurry for her to grow up and am savouring every moment and stage, but no matter how much I try to slow things down time is still zooming past. It certainly doesn't feel like a month has passed since I was writing her 8 month update. When Lucas was this age I was heading back to work! I'm glad I'm not at that stage just quite yet this time round because as grown up as she's getting, she still seems too little for me to be leaving her (uh oh, over-protective mummy alert). My little live wire is still waking early. Its been anywhere between 5-5.30am, every morning for the past 5 weeks I'd say. This has definitely been the hardest part of the last month. A 5.30am start certainly makes for long days. Lucas usually wakes up between 7-7.30am and it feels like Charlotte and I have done half a day by the time we're saying "morning" to him. I had been putting her early starts down to a development leap or a blip, as prior to 5 weeks ago she was sleeping until 7am most mornings. But as another week passes and we still hear the first squeaks from her before 5,30am I'm starting to think that this is just what she's going to be like, an early riser. Lets hope not though. When did I ever think I'd be praying for a 6,30am lie in!! Naps have now fallen into a bit of a routine though thankfully. One mid morning and one in the afternoon. I try to use these small windows of time to get a few things done around the house or checked off my ever growing 'to-do list', but more importantly I always try to have some one on one time with Lucas. Even just 20 minutes to do some colouring, play a game or sit and cuddle him while we watch one of his favourite programmes together. I think he really looks forward to these parts of our day and so do I. This month I seem to have moved away from finger foods in favour of good old purees. I still give Charlotte finger foods as snacks and along with her meals, but just not as her main meal. I wasn't convinced she was eating enough when it was only finger foods, which was getting a bit stressful, especially when she's such a little thing anyway. She loves purees at the minute and her favourites are sweet vegetable medley and chicken and tomato (both Anabel Karmel favourites). She's getting better at her sippy cup of water at mealtimes, but not as confident as Lucas was by this stage. Is this because she doesn't have a bottle I wonder? We've been trying to encourage her to do it herself, but she's a lazy little thing and most of the time sits there like a little sparrow, mouth wide open, waiting for you to pour it in for her. I'm still breastfeeding her too, but I'm going to be really honest...as much as I have enjoyed feeding her I think I'm almost done. After 9 months I'm exhausted!! She still milk feeds a lot and from a purely selfish point of you I feel its starting to take its toll on me. Its really difficult though because as much as I feel like I'm ready to stop feeding her, the thought of stopping still makes me feel a bit sad. Does that make sense? I've loved being able to breastfeed this time around, especially as I was so disappointed when I couldn't feed Lucas, but I think you know yourself when its time. I'm quite nervous though about the whole transition and what Charlotte will make of it. I'll let you know how we get on. I took Charlotte along to our Health Visitor yesterday to be weighed. We hadn't been for 3 or so months and I think by this stage there's not as much need for frequent check-ins, but curiosity got the better of me. She's now 16lbs 80z. Still a little wee toot but the Health Visitor was happy with her progress and thinks she's just going to be "petite". One of the biggest milestones this month is that she's finally got her first teeth. Her two bottom front teeth poked their way through a couple of weeks ago after a few days of a not so happy Charlotte. I I was expecting that once they had 'cut' they would come through quite quickly but its still only the tips of both the teeth that we can see. She's still not crawling but has mastered the art of bum shuffling and wastes no time getting from one side of the room to the other and even from one room to the next now. This means that everything is of interest to her. Sockets, switches, wires, etc so baby proofing our house is a must for this weekend. Another thing which I've really noticed this month is that she is expressing herself more. If she doesn't like something or is annoyed or frustrated, you know about it. Lucas loves giving her cuddles but now if she doesn't want him to, when she's tired or just isn't in the mood she screeches at him. Poor Lucas! She's also started getting her own back on him though which is so funny to watch. Lucas loves teasing her in the bath by stealing the toy she is playing with but the last few times he's done this she's hit her hand on the water, splashing Lucas. The grin on her face that follows shows just how proud of herself she is. This last month I haven't felt great which has been quite tough. My immune system has really taken a hit this winter - I've never had so many colds, tummy bugs and just generally feeling pretty rubbish and run down. It was starting to get to me and was making the days feel really hardwork, but I finally feel like I've got over a virus which had been lingering and am thankfully feeling much better and have got my energy back. Its made me realise how important it is to take care of myself, especially when there's no such thing as a 'sick day' when you're a mum. I'm the worlds worst at not drinking enough water, not eating properly but just snacking on rubbish, not exercising and generally just putting my own well-being last (I think most mums do). But looking after two children when you're feeling bleugh is the worst and so I've started taking little steps to look after myself more, in the hope I stop feeling like this quite so often and do you know what, I feel better already. I'm forcing myself to drink more water as I think a lot of how rubbish I was feeling was down to dehydration. I've also started going to a pilates/ yoga class once a week and have gone on my first run/ walk in preparation for the 5K I'm doing. As tough as it can be forcing myself out to an exercise class once the kids are in bed, I feel so much better after doing it. The other thing, which I think I've mentioned before is that I have quite bad Diastasis Recti (separation of the tummy muscles) from my two pregnancies. For some reason its now worse than ever and most days makes me look like I'm about 3/4 months pregnant. This was really starting to have an effect on my confidence and so this month I've started making a real effort to do some exercises every night to try and bring these muscles back together. These need to come back together before you should even attempt things like crunches and I'm told its a slow process. Not good when you're as impatient as I am, but I'm going to try sticking at it. Sorry, my part of this month's update has been pretty miserable. Next month will be more upbeat, I promise. Copyright©2014 A Cosy Cup of Life. Powered by Blogger.